Often I get questions like, must I become an I, T, π- or M-shaped professional in order to be prepared for the – near – future? Well, I don’t think so. Personally I think you should move towards an Y-shaped professional or even better towards an antenna or funnel-shaped professional! But before I explain this, I’ll start with the IT situation thirty years ago. I’ll do this by means of the ever changing distance between software developers and testers in the past thirty years. Then I’ll extrapolate this – along with the shapes – to the future. Figure 1. Distance between Developers and Testers. A few years later testing became a separate role. This was just to make ‘sure’ someone else besides the developer would give an opinion about the quality of the product. Then projects started working with test levels (unit test, system test, user acceptance test, etc.) and test teams were created. Not long after that organizations started thinking of a more effective and efficient way of running tests for all kinds of different projects. And see what happened, suddenly test departments popped up like mushrooms. In such a test department I was an I-shaped professional. I was solely concerned with testing, that was my primary focus. I hardly spoke with others then testers. An I-shaped person is someone who is excellent in one expertise. And then the next step. When all testing activities are executed in a testing department you could ‘easily’ ship those to an environment (e.g. organization, country) in order to gain for example cost reduction. This process is often called outsourcing. 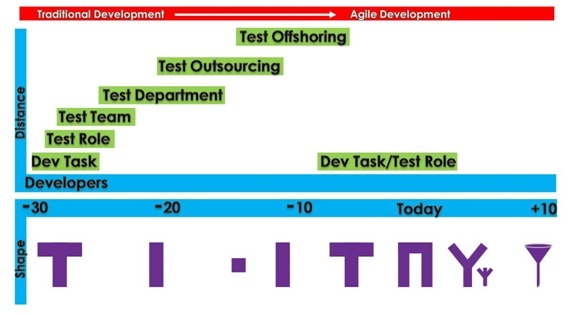 The last phase – distance wise (between developer and tester) – is offshoring. In both outsourcing and offshoring projects I saw testers degenerate to dot-shaped professionals. They were allowed either to design test cases or to execute test cases. You can imagine the problems that were caused by this. It didn’t take long before the I-shaped tester was introduced once again. Agile development became hot (e.g. scrum) and suddenly everything changed. The distance between the developer and the tester should be minimal (so no more outsourcing and certainly no offshoring). Even better when the developer tests him or herself. Testing – along with the T-shaped professional – was back to the point where it all started with, to a task or role. When I look at the current situation people are talking about π- and M-shaped professionals. A π-shaped person who is an expert in two expertises and an M-shaped person even in three expertises. However how does this – for instance a π-shaped person – help the project when a person is an excellent designer and an excellent programmer? This person cannot do both at the same time, so it doesn’t speed up the project. Of course when such a person is designing and the programmer gets ill or whatever, this person could take over the program activities (and stop designing). Personally I think it could be ‘handy’ to become a π- or M-shaped professional in order to improve your job opportunities. Although I think it not that easy to become a real expert in two or more expertises. Beyond I-, T-, π- and M-shaped testers I see a future for funnel-shaped testers. That’s a person who is specialized in software quality, really an expert. Who is exploring all the time, looking for new insights, new developments, not necessarily IT related. It could be virtual anything as long as you keep in mind how this could innovate the work you’re doing, how this could bring your own expertise to a new – higher – level. And last but not least: Just do it! Don’t be an expert in testing and for example visit test conferences only, but look at these conferences for aspects which you could use to innovate your own expertise. Use, adapt, translate, share and implement it. 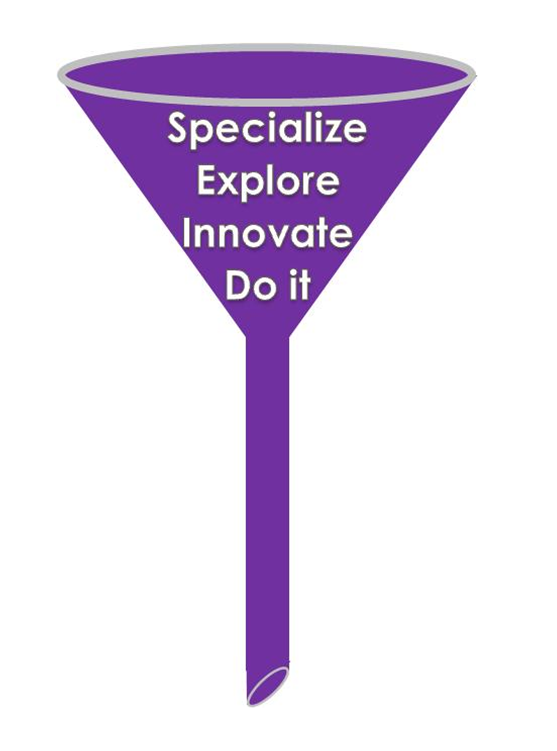 In other words: Specialize, Explore, Innovate and Do it (refer figure 2). I’m convinced when you’re a truly funnel-shaped person, both your colleagues and employer will recognize your incredible added value. Simply by being on top of new developments, exploring new things and adapting/adding these to your own expertise, everyone around you – as well as the project – will profit from this and your level of expertise will rise (as your star) all the time, which makes you a very popular team member. And last but not least, you’ll always have fun and never bored with your own expertise, because you move forward all the time. Versatile enough to test virtually any size and shape of metal specimen, these Brinell testers are easy-to-use. When your testing requirements go beyond the capabilities of standard hardness testers , our custom automation group can fill your needs.